Third Cinema (Spanish: Tercer Cine) is a Latin American film movement that started in the 1960s–70s which decries neocolonialism, the capitalist system, and the Hollywood model of cinema as mere entertainment to make money. The term was coined in the manifesto Hacia un tercer cine (Toward a Third Cinema), written in the late 1960s by Argentine filmmakers Fernando Solanas and Octavio Getino, members of the Grupo Cine Liberación and published in 1969 in the cinema journal Tricontinental by the OSPAAAL (Organization of Solidarity with the People of Asia, Africa and Latin America). 2.1 "Toward a Third Cinema"
Solanas and Getino's manifesto considers 'First Cinema' to be the Hollywood production model that idealizes bourgeois values to a passive audience through escapist spectacle and individual characters. 'Second Cinema' is the European art film, which rejects Hollywood conventions but is centred on the individual expression of the auteur director. Third Cinema is meant to be non-commercialized, challenging Hollywood's model. Third Cinema rejects the view of cinema as a vehicle for personal expression, seeing the director instead as part of a collective; it appeals to the masses by presenting the truth and inspiring revolutionary activism. Solanas and Getino argue that traditional exhibition models also need to be avoided: the films should be screened clandestinely, both in order to avoid censorship and commercial networks, but also so that the viewer must take a risk to see them. There are four manifestos accredited to beginning the genre of Third Cinema: Glauber Rocha’s “Aesthetic of Hunger” (1965), Julio García Espinosa’s “For an Imperfect Cinema” (1969), “Problems of Form and Content in Revolutionary Cinema” (1976) by Jorge Sanjinés, and finally “Toward a Third Cinema” (1969) by Fernando Solanas and Octavio Getino. Although all four define the broad and far reaching genre, Solanas and Getino’s “Toward a Third Cinema” is well known for its political stance and outline of the genre. 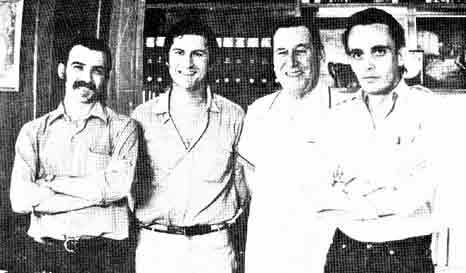 (from left) filmmakers Gerardo Vallejo and Fernando Solanas, former president of Argentina, Juan Domingo Perón, and filmmaker Octavio Getino in 1971. With the advancement of technology in film in the late 1960s (simplification of cameras and tape recorders, rapid film that can be shot in normal light, automatic light meters, improved audio/visual synchronization), Solanas and Getino argue that an alternative cinema is finally possible. The authors cite the Imperfect Cinema movement in Cuba, Cinegiornali liberi in Italy, Zengakuren documentaries in Japan as proof that it is already happening. Paradoxically, Solanas and Getino continue to state that it is not enough to simply rebel against 'the System'. The manifesto uses Jean-Luc Godard and the French New Wave throughout as a formidable example of a group which failed to properly to subvert 'the System'. Referring to it as “second cinema” or “author's cinema”, the problem begins with the genre's attempt to exist parallel, be distributed by, and funded by 'the System'. Solanas and Getino quote Godard's self-description as being 'trapped inside the fortress' and refer to the metaphor throughout the manifesto. Notable films include Sarah Maldoror’s Sambizanga (Mozambique, 1972) which takes place in Angola where a woman awakens to “revolutionary consciousness” to the struggle of the ruling party the MPLA. In Heiny Srour’s documentary Saat al Tahrir (The Hour of Liberation) (Oman, 1973) followed women fighters during the revolution in Oman. Srour’s 1984 film Leila wal dhiab (Leila and the Wolves) (Lebanon) followed the role of women in the Palestine Liberation Movement. Helena Solberg Ladd’s Nicaragua Up From the Ashes (U.S. 1982) documents the role of women in the Sandinista revolution. Sara Gomez’s De cierta manera (One Way or Another) epitomizes Third Cinema’s involvement in the intersection of fiction and documentary as it gives a feminist critique of the Cuban revolution. ^ Stam, Robert (2003). "Beyond Third Cinema: The Aesthetics of Hybridity". In Gunerante, Anthony R.; Dissanayake, Wimal. Rethinking Third Cinema. London: Routledge. pp. 31–48. ^ Guneratne, Anthony R. (2003). "Introduction: Rethinking Third Cinema". In Guneratne, Anthony R.; Dissanayake, Wimal. Rethinking Third Cinema. London: Routledge. pp. 1–28. ^ a b c d e f g h i j Getino, Octavio; Solanas, Fernando (1969). "Hacia un Tercer Cine (Toward a Third Cinema)" (PDF). Tricontinental: 107–132. Retrieved April 9, 2016. ^ a b c Shohat, Ella (2003). "Post-Third-Worldist culture". In Guneratne, Anthony R.; Dissanayake, Wimal. Rethinking Third Cinema. London: Routledge. pp. 51–78. ^ "Laila and the Wolves + Ismael - Eye On Palestine". Eye On Palestine. Retrieved 2016-04-11.